"to modernize and stylize the classical tradition" - Albert Wein talking about his work. Albert was born in 1915 in New York and was heavily influenced by his successful artist mother, Elsa Wein. At age nine his mother enrolled herself and him in classes at the Maryland Institute, a school whose curriculum was based around Classicism. The Stock Market crash of 1929 put a hault to his studies and forced him to return to New York. He registered at the National Academy of Design and studied under the respected painter Ivan Olinsky. In 1932 he enrolled in classes at the Beaux-Arts Institute in New York. This is where he discovered sculpture. He won honorable mention for his sculpture Family Group in 1933 and second place for his Jesus is Entombed in the school's Paris Prize competition. In 1947 he won the Prix de Rome scholarship to study in the American Academy in Rome. He stayed there for two years while traveling through Europe. Greek and Roman sculptures would prove to be a huge influence on him because of this trip. 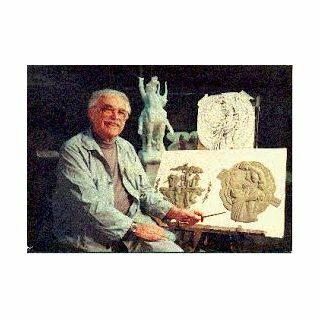 In 1950 he returned to the United States to join the National Sculpture Society. He would proceed to produce bas-relief works for Steuben Glass Company while being a member of the Society of Medallists. Just eleven years before his death in 1991 he was awarded a Rockefeller Foundation grant for study in Bellagio, Italy. He was able to join Classicism and Modernism perfectly in the realm of sculpture.